This website is graphically intensive, so I hope it's worth the wait! It has a pair of very large plates for the front, not underlapping plates and small lung plates, the shoulder plates are too narrow. There are no waist plates. The front panel plates are overlapping each other and the back panel plates are underlapping each other, they should have been underlapping above the waist and overlapping under the waist for the front, and over lapping above the waist and under lapping under the waist for the back. The plates are too big and square and painted black, not tinned, and the nail heads are too small. 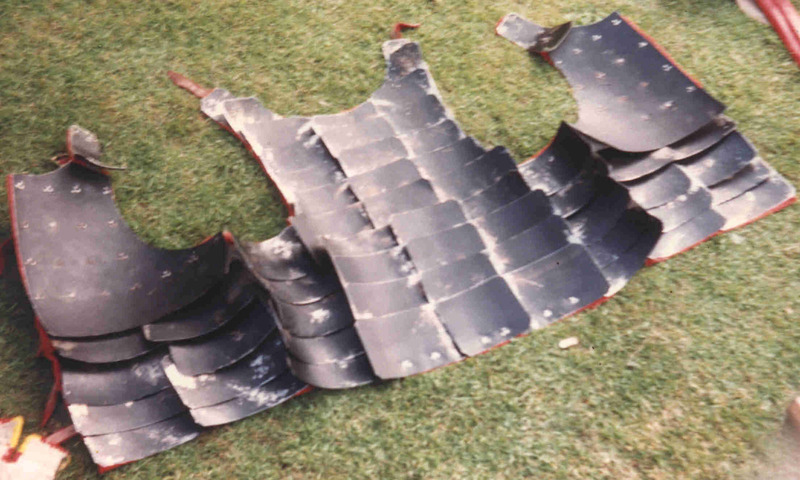 Great difficulty was found during construction because it was made in one piece and the entire brigandine had to be turned over continuosly to rivet in new plates, such that even before construction was finished nails in the top back rows were ripping through. It did proove, however, that there is no way that brigandines were made in the inside of a barrel, as some people suggested....! And the armour was very serviceable and was more comfortable to wear than a Back and Breast. These pages best viewed in 600 X 800 size.